Scientists at Tokyo Institute of Technology have developed a new method for scheduling the activation and deactivation of power generators that minimizes costs and ensures reliability while addressing the issues prevalent in previous methods. Electrical generators have start-up and shut-down times and associated costs. 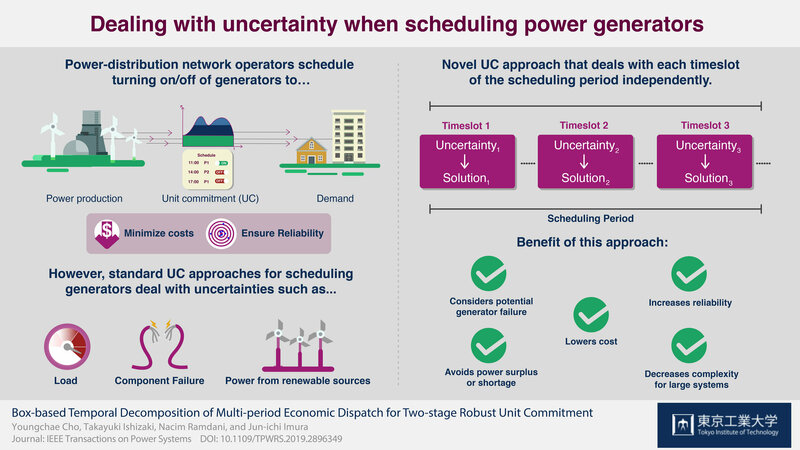 Because multiple generators are generally available at any given time, and they cannot be activated or deactivated quickly, network operators usually schedule these “on” and “off” operations in advance according to predicted loads in order to reduce costs. These schedules are made based on mathematical models and strategies that deal with a tradeoff involving minimizing costs and saving energy on the one hand, and ensuring reliability on the other. One such family of mathematical optimization problems is referred to as “unit commitment (UC)” and has been used to determine the required states (on/off) of generators in power systems. As mentioned before, these problems and the schedule are determined in advance, which implies having to deal with uncertainty in multiple variables across the board, such as load, generator availability and failures, and renewable energy input. Available methods to devise such schedules have several disadvantages. Some of them take the scheduled period as a whole and require accounting for the dynamics of the generators and uncertain variables, but this uncertainty is usually not properly addressed and overly conservative schedules are obtained. Other methods are unable to deal with energy storage systems, which are essential for renewable energy technologies. Considering these problems, a team of researchers from Tokyo Institute of Technology (Tokyo Tech), led by Professor Jun-ichi Imura, developed a novel UC method with an interesting twist to overcome these issues. “The proposed method has advantages over previous UC methods in several ways and explicitly addresses their main issues,” explains Imura. In their approach, instead of taking the scheduled period as a whole and having to deal with system dynamics, the period is divided into timeslots to be dealt with (optimized for) individually in “real time”. To do this, the uncertain values in the model are independently given upper and lower limits for each timeslot, and the interplay of these limits and other constraints are used to derive feasible optimal solutions. What’s more, the method can be adjusted to consider potential generator outages. The researchers will continue working on various aspects of their new approach, such as on other ways to calculate the limits for the uncertain variables for each timeslot, to further improve the results. The development and implementation of such efficient strategies in power-distribution networks will ensure access to cheap and reliable electricity.